FAQ Fridays: Why Are We Not Targeting Make/Model Terms with Paid Search? Here at Remora, we manage a lot of paid search for our dealerships and are known for running a very tight ship when it comes to what we target. The reason for this different approach? There are a plethora of search terms you simply should not be showing up for as a dealership trying to sell new and used vehicles. We see countless other competing dealerships who are paying for terms that we do not recommend, and I honestly love seeing the competition engage in this faux pas. The fact of the matter is that the cost of paid search is on the rise and shows no signs of going backward. When you have dealerships competing with one another and your own manufacturer bidding against you, these costs add up quickly. This is why it is very important to be cognizant of what you are paying for and why sometimes certain terms are nothing more than bad investments. Why are we not going after "make/model" terms like one of our competitors in town? We had a support ticket come in from a very good customer of ours whom I have cultivated a wonderful relationship with over the years. She asked, "Why are we not going after 'make/model' terms like one of our competitors in town?" When someone is searching just for a make/model term ("Chevy Silverado 1500," "Ford Explorer," etc. ), there is no buying intent behind this search – and no real opportunity for your dealership to create a sale. Simply put, unless you have an endless budget for your paid search marketing and enjoy lighting money on fire, we absolutely do not recommend targeting these keywords. Example search engine results page (SERP) for the "Chevy Silverado 1500" make/model term. Here is a make/model search results for Chevy Silverado 1500. What do we see? The manufacturer is also targeting this search, which in turn takes the viewer to the official Chevrolet Silverado page. Ford, who is a competing manufacturer, is conquesting (which you can read more about in our detailed review of this practice) with a 2019 Ford F-150 and comparing the features of the F-150 to the Chevy Silverado 1500. You then have two dealers who are competing for the paid third and fourth positions who (we would hope) are not trying to outbid the manufacturers. 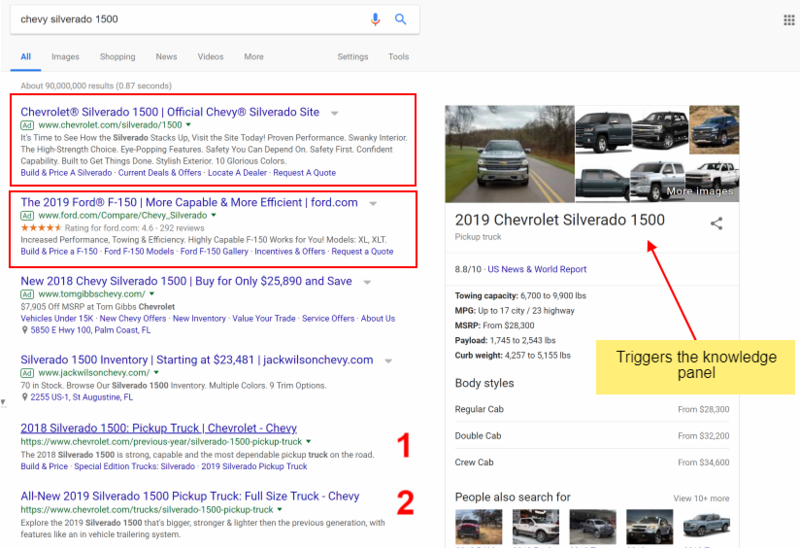 The first two organic results are that of Chevrolet.com, who is the manufacturer with the most authority on all things related to a Chevy Silverado 1500 search. Do you want to compete directly with the manufacturer? No, you do not. Do want to compete directly with another manufacturer who is trying to convince someone who is looking for a Silverado to switch to an F-150? No, you do not. It is the manufacturer's job to try and convince the general public to buy their vehicles, not yours. Once that person is convinced on what they want to buy, that is when you target your ads towards buyer intent keyword searches. Why Are Those Who Engage in These Types of Searches Not Buyers? They may end up being a buyer at some point down the road, but in most cases, those who query make/model terms are not that far down the funnel yet. You can tell because the other organic results are that of Cars.com, Kelley Blue Book (KBB), and U.S. News & World Report; all pages that show more information about the truck, reviews, technical specs, images, videos, etc. Google knows more about the average viewer than many of us are willing (or want) to believe. They know for this search term that it is related to someone doing more research than actually looking to buy right now. Another sign of this being a research term is that it has triggered the Knowledge Panel on the right side of the SERP. Google is unsure as to what exactly the user is looking for when they engage in this query. Could it be a part, tires, or trailer to pull equipment, or is the user looking to buy a new or used truck? What If They Eventually Want to Buy a Chevy Silverado 1500? When the user is ready to make a purchase, he or she will perform search queries targeted closer to what they want to buy. Make/model trims, colors, specials, pricing, leasing, etc. all show signs of buying intent. Couple that with dealer- or location-specific vehicle searches and those are the gems you want to go after with your dealership's precious paid search budget. At the end of the day, our main job is to put the best ads in front of a car shopper, not a car researcher. If you would like us to look into your current paid search campaigns, please reach out to me via the contact page and I will happily point you in a better direction for your paid search campaigns. Yes, I can give you better results and I am sure you are probably spending more than you need to because you (or the agency handling this process on your behalf) are targeting the wrong things.